I hope everyone in our Inspy Romance community had a wonderful and blessed Christmas! We did here. No snow, but bright crisp days and frosty nights. Christmas Eve our usual “couple” dinner for just my husband and me; Christmas Day lunch with his elderly mom; and Boxing Day to recover, relax, and read the books we gave each other! 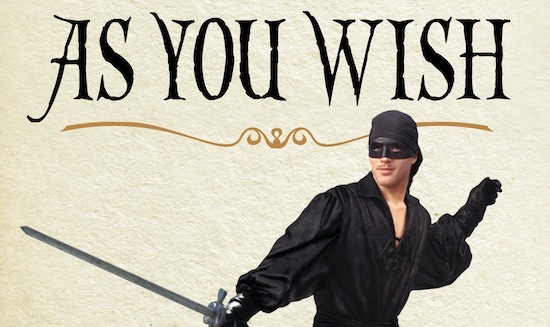 One of my all time favorite films is A Princess Bride, so I’m thrilled that my husband gave me Cary Elwes’ book As You Wish: Inconceivable Tales from the Making of The Princess Bride. The image below is half the cover. So much fun reading the stories behind the movie. It has me wanting to watch the movie again. If you haven’t seen it, it’s a funny and tender fairy-tale-on-steroids framed as a storybook a grandfather reads to his sick grandson. It keeps its tongue firmly in cheek, yet like every true classic, there’s spiritual truth in there too. As the film trailer says, it has it all — “Fencing. Fighting. Torture. Revenge. Giants. Monsters. Chases. Escapes. True love. Miracles.” (And if you haven’t seen it yet, be warned, just a little bad language). I love the scene explaining the meaning behind that last line. It’s really got to be seen, not read as dialogue on its own, because it’s all in the physical beats, the body language, the looks they exchange. I couldn’t find any official clip of this scene on YouTube I felt comfortable to link to, though there are plenty of unofficial ones. The Amazon page for the DVD does have a clip, though it takes some locating! Scroll down the page to just beneath the product details and bestseller ranking, and this scene is the final featured clip on the second page of links (sorry, there’s also an ad!). “As you wish.” What a difference it will make if I can say that to the people I love! 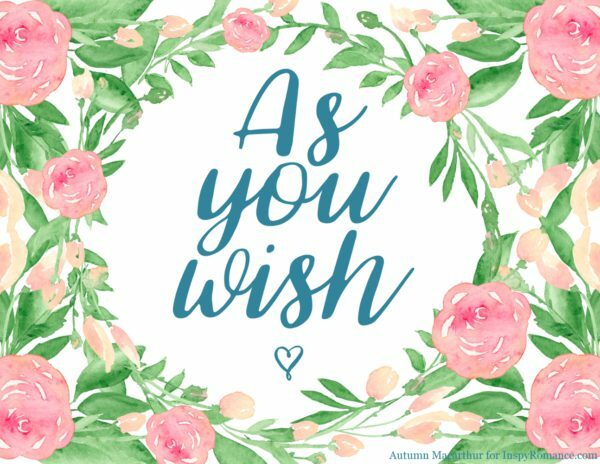 Lately, I keep getting little nudges to remind me that “as you wish” is the way God loves us, too. He gives and gives and gives, with a love that gave up being King in heaven to be born in a stable. And He wants us to love the same way. To be willing to give and willing to serve and willing to let Him work in our lives. To have a heart that says “as you wish” to Him and to those we love. Many of us here use the My One Word idea rather than New Year’s resolutions, choosing one word to represent what changes we most hope God will make in us during the year, and focusing on that. LOL, or as I usually find, getting given the word by God to remind me of what HE most hopes to change in me! My one word for 2017 is flow. And I know one of the ways God wants me to live that flow is to say “as you wish” more often. I’m going to try. Because don’t we all need more true love in our lives? I made this image as a reminder for myself, and I thought perhaps you might like it too! Here’s a free printable pdf of the image above for you to download, in either Letter or A4 size. What’s your favorite line from your favorite film or book? One comment made before January 6th will be chosen at random to win the choice of any of my ebooks (multi-author boxed sets excluded). Like you, my all time favorite is “The Princess Bride”. I saw it for the 1st time in 1991, & instantly fell in love with it. I’ve seen it many times over the years, & I never get tired of it. It’s nice to see that you enjoy it for the same reasons I do. My favorite line that I look forward hearing the most is, “Wuv, twu wuv”. That whole scene is so hilarious, Esther! I really enjoyed your connection of “as you wish” to God’s answers to our most inner prayers. I’ve watched Princess Bride more than once as probably many others and Will’s devotion gets me every time. I’ve been fascinated with Robin Jones Gunn’s Christy Miller series while growing up and in one of the earlier books, Christy gets a bracelet with the word “Forever” engraved. The bracelet represents Todd’s promise, but also God’s promise in a way (she’d just accepted Him in her life) and it follows them throughout the young age series and later. I really like the idea of such a simple, yet, meaningful promise. Lately I’ve been thinking a lot about giving birth to my first child and how impossibly incredible, and thus, what a miracle it was, for God to actually give us His Son to be born for us in a stable. My sister, whose a pediatrician, and I were talking about the conditions of His birth in the same week I went to see the hospital in which I plan to give birth to my son and the comparison was just terrifying. We’d be fools not to let Him work in any other area of our lives. Which reminds me of the your post about “one word” last month. I’ve been thinking about the word I’ve chosen then (Surrender). I am not one to make resolutions or anything like that, but I do like the idea of choosing a word to represent my expectations for the year and focusing on that. Surrendering to the Lord sure represents well what I’ll be going through. Sitting here grinning! I went on Robin Jones Gunn’s website to look at those books, because I’m sure I’ve read some of her books, but not that series. Odd, as it looks wonderful! Anyway, the first book I see is “Christy & Todd, the College Years : As You Wish”! LOL! I’ve been thinking a lot about the conditions Jesus was born into too this Christmas, Priscila. It feels like such a wonderful sign of how much He loves us. The Lord of all was willing to dwell in a stable, with straw and manure and farm animals. God is telling us that none of us are too lowly or too soiled by life for Him to dwell within. I love that thought! Surrender sounds the perfect word for you as you approach motherhood! I’ve been praying you had a restful Christmas and the work pressure is easing up! If you went to her website, you might have seen the bracelet they have for sale as well. It’s definitely not like I pictured it when I was younger, but the message is there. I do remember reading “as you wish” and although there isn’t a direct meaning associated with Princess Bride, the Lord’s message is clear. Thank you for your prayers. I wish you a happy New Year and that you may continue to be a blessing among us through your books. I’m not one to make resolutions either, Autumn. Using “one word” as a guidance for the year has worked best for me in the past. I’ve narrowed mine down to two,,,I guess I better hurry up and decide. LOL, you have two days to decide, Jill! I love You’ve Got Mail, too! I need to watch it again soon. And that “bouquet of newly sharpened pencils” is a great line! I can imagine all the different colours. I like the phrase, as you wish. The selflessness that it embodies is inspiring. Too often , I make it as I wish, instead of looking to serve other people. In the movie i enjoy the changes that happen between the couple. Me too, Diana, to let go of my stubborn self-will and serve gladly is something that can be a big battle for me! I love that movie! Thanks for sharing parts of it. I never thought about applying it as God saying it to us and us saying it to Him. You have given me a new and wonderful thing to dwell on for this new year! I personally think of God’s presence when I think of this line. May His Presence ever be with you as you go through this new year! I’m glad you enjoyed the post, Marylin! i love the princess bride as well and my favorite line is As you wish. I can’t think of any movie lines right now, but I really do like your comparison of “As you wish” to our need to respond to God with “Thy will be done.” My word for this year should be “Acceptance.” After praying for weeks with tears (which only give me migraines), I need to accept that what I have been resisting as such a calamity (our son’s moving far away) may be God’s will that I just can’t see yet. I am trying to put this all into His hands. Hugs, Kathryn. Praying for you. It can be so hard sometimes to see the purpose in things at the time. Autumn, I just finished _Least Expected_, and I must let you know how much the beach scene where Maggie finds the blue piece of seaglass affected me. Instead of bemoaning both my son’s and my mis-steps in our pasts, the thought that God can use everything in our lives, bad as well as good, to mold us into Christ’s likeness, if we’ll let Him, has been so encouraging as I head into this challenging new year. Oh, Kathryn, I am so grateful that scene helped and that God could use it to encourage you! I’ve had my share of missteps I’ve regretted, grieved and been angry over. God used me writing that scene to teach me how much He really wants us to hand them all over to Him so we can feel the joy of His presence with us. Thanks for the download. It is so pretty and a good reminder.